2016 Funko Game of Thrones Mystery Minis Series 3 features more miniature figures from the celebrated GoT series. Collectors will see some familiar names and also a few new faces in the latest batch. Like all the Mystery Minis, the Game of Thrones blind-box figures are a surprise until they are opened, adding to the excitement of chasing the set and finding potentially limited figures. 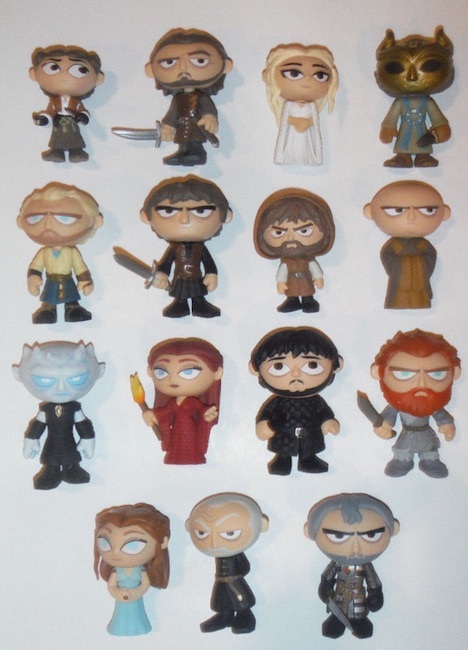 Shop for Funko Game of Thrones Mystery Minis Series 3 Figures on eBay. Like the show itself, 2016 Funko Game of Thrones Mystery Minis Series 3 grows the rapidly building base of figures. 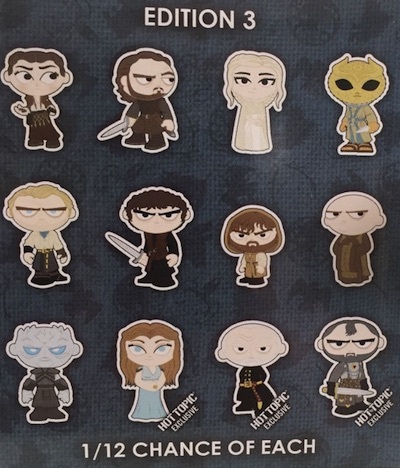 In addition to recurring subjects like Daenerys Targaryen and Tyrion Lannister, fans can also find mini debuts for key secondary characters such as Melisandre, Samwell Tarley, Varys and Jorah Mormont. Just be sure to keep a watch for the Night's King and the Sons of the Harpy! Although full odds were not provided, previous releases featured varying odds that made some figures much tougher to find. There were also figures that were exclusive to certain retail outlets. That is the case this time as well as Stannis, Margaery and Tywin join the fun as Hot Topic exclusives. Hot Topic boxes list overall rarity as 1:12 for each figure. However, there are 15 total subjects meaning the Sam, Tormund and Melisandre are only found in the main format. They also have 1:12 odds. 2016 Funko Game of Thrones Mystery Minis Series 3 figures each stand approximately 2.5 inches tall, but Tyrion might be just a little smaller than that. The full list of options can be seen below and additional figures or details will be added if there is any updated information. Funko Mystery Mini Game Of Thrones Series 3 Lot Edition 3. 11 figures. What happened to Daavos and Stannis? I swear there is no love for those two. I have a Margaery if you want her.